Winter Cruise 2015! | 2018, Southern Ocean adventures: off the benches, in the waves and in the sky ..
Raïssa Philibert: I’m Raissa Philibert. I joined the Earth Sciences department as a postdoc after a PhD at the University of Cape Town. My research interests are centered around microbial ecology. My PhD was focused on the role of phytoplankton in the nitrogen cycle. My current research project involves investigating how trace metals concentrations and light limitation affect phytoplankton growth. When I’m not studying phytoplankton, I can be found running, hiking or discussing politics. Sandi Smart: My name is Sandi Smart, born and bred Capetonian. I discovered oceanography during my undergrad years at UCT. At that point, I hadn’t decided which field to study and was considering anything from archaeology to astronomy! What intrigued me about oceanography (besides the opportunities to go on exciting research voyages) was the fact that it brings together so many different fields (biology, chemistry, physics, geology, climatology etc.) with a common goal of understanding the Earth’s oceans. For my honours project (in 2011), I studied the unusually warm sea-surface temperature events (called “Benguela Niños”) which occur periodically off the coast of northern Namibia / southern Angola, and the impact that these events can have on Southern African rainfall. I then went on to do my Master’s degree in Southern Ocean biogeochemistry, with a focus on nutrient cycling in the wintertime Antarctic ocean. I was fortunate enough to go on the first scientific voyage of the new S.A. Agulhas in July 2012, and through collaboration with SOCCO (CSIR) and Princeton University (USA), I travelled to the US to analyse my samples in the Sigman Lab. In February 2015, I started my PhD at Stellenbosch University, collaborating with Princeton and the Max Planck Institute for Chemistry (Germany). As part of my project, I hope to reconstruct past biological nutrient consumption from a Subantarctic sediment core using the organic nitrogen preserved within tiny fossilized zooplankton shells. My main goal for this cruise (winter 2015) is to collect zooplankton samples from the modern ocean that will help me to interpret this “paleo-record”. Alice Mühlroth: I have been a PhD candidate since 2013 at the Norwegian University of Science and Technology (NTNU) in Trondheim. I undertook my master of science in molecular biotechnology at the RWTH-Aachen University in Germany. I am a very curious person by nature, which lead me to undertake a PhD in Norway, and now for what I believe will be an unforgettable research cruise on the SA Agulhas 2. Although my PhD research intends to assess the usage of microalgae as an n-3 long chain polyunsaturated fatty acid fortified aqua feed, on this trip I will focus on investigating the microbial composition during winter in the South Atlantic Ocean. I feel very fortunate to have been given this extraordinary opportunity as a biotechnologist to join oceanographers, to follow my interests and expand my research field. 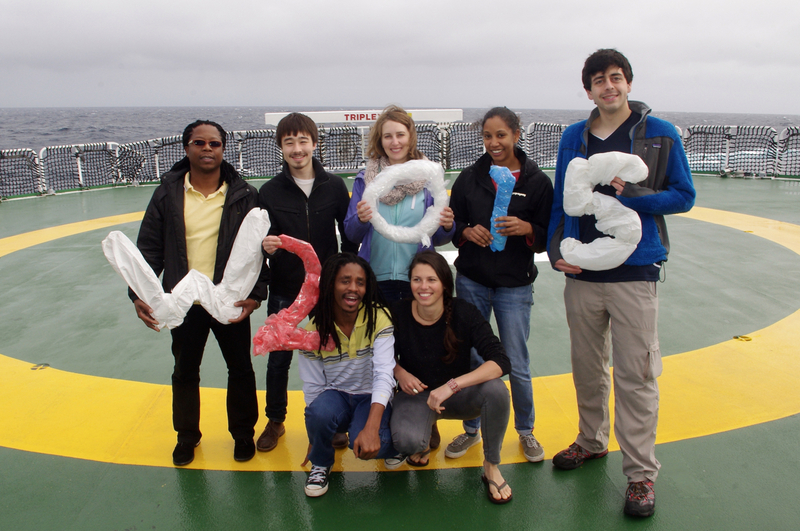 Preston Kemeny: Preston graduated from Princeton University in June and is extremely excited to be on the Agulhas! His undergraduate thesis research focused on using measurements of nitrogen and oxygen isotopes of nitrate in seawater to understand modern and paleoceanographic isotope data, and he will continue this work in the coming year before beginning graduate school in the fall. Preston enjoys hiking, camping, and being surrounded for miles by nothing but frigid, frigid ocean. Ethan Campbell: As the youngest member of the Winter 2015 cruise team, it is with both excitement and trepidation that I set sail onboard the S.A. Agulhas II. I am entering my fourth year as an undergraduate at Princeton University, where I have been studying in the Department of Geosciences with a focus on physical oceanography and climate. With recent Princeton graduate Preston Kemeny, I will be helping out with several projects onboard, including seawater sampling for nitrogen isotope analysis (a collaboration between Stellenbosch University, University of Cape Town, and Princeton) and trace metal analysis (which involves CSIR and SU). It is my hope that samples collected this winter will form the basis for my senior thesis next year. I want to acknowledge the support of the Princeton Environmental Institute, whose generous funding has enabled my participation in the cruise. In addition to posting here, I plan to keep friends and family updated on my personal blog at furiousfifties.wordpress.com. Check it out!